Robotic surgery is one of the most advanced surgical techniques used today. Our general surgeon is well-versed and highly trained in this high-tech surgery. We use the esteemed da Vinci Surgical System, which allows us to perform complex surgical procedures using minimally invasive robotic surgery. During your procedure, our general surgeon controls the da Vinci robot from a console. The three-dimensional technology of the di Vinci provides advanced visuals, allowing for more precise access to tissues, lymph nodes, tumors and other areas of interest. In many cases, more can be seen using the robot vs. using more invasive surgical procedures. Some people are apprehensive about robotic surgery because they think that the robot is controlling the procedure. This is simply not true. Your general surgeon is 100% completely in control of the robot’s movements at all times. In fact, the da Vinci cannot function without human involvement. 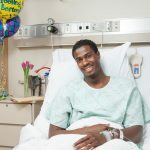 According to www.davincisurgery.com, over three million patients worldwide have benefited from this technology so far. The beauty of robotic surgery is that it requires only a few small incisions. This allows for a much quicker recovery time, and, in many cases, less scarring. The da Vinci was approved by the Food and Drug Administration in 2000. Our general surgeon has trained extensively on using the da Vinci and participates in continuing education courses on the ever-evolving topic of robotic surgery. It is important to note that robotic surgery is not ideal for every patient. Our general surgeon evaluates each patient and decides on a case-by-case basis which approach is best. Interested in learning more? Schedule a consultation today.